The Pre-Hispanic Town of Uxmal is a large ruined city of the Maya civilization. Maya chronicles say that Uxmal was founded about 500 by Hun Uitzil Chac Tutul Xiu, although the exact date of occupation is unknown. Most of the architecture visible today was built between about 700 and 1100. 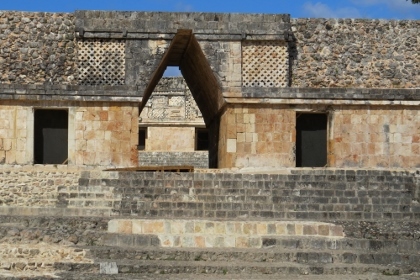 Besides the main complex at Uxmal, also the nearby sites of Sayil, Kabah and Labna are part of this serial nomination. Although its name suggests otherwise, this is a serial nomination comprising the sites of Sayil, Kabah and Labna in addition to Uxmal itself. In the AB evaluation a fifth location is mentioned (Xpalak), but this one has mysteriously disappeared from the final nomination. There’s a WH inscription sign at the entrance of Uxmal which confirms this, as it says “Prehispanic cities of the Puuc: Uxmal, Kabah, Sayil and Labna”. 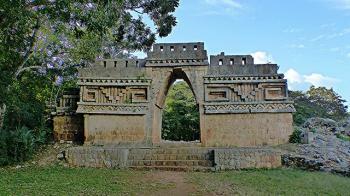 “Puuc” is the name of the hilly region just below Merida where these sites are located. And it’s the name of the architectural style named after it. I started my visit at Kabah, some 20kms from Uxmal. It’s a nice drive there on a small road that goes up and down and up again. My car was the fourth in the parking lot, which could not hold more than 5 cars or so. It’s a pleasure to be away from the crowds again! Kabah isn’t a big site, I spent 45 minutes there. It is mostly known for its “Palace of the Masks”, which has a façade decorated with hundreds of stone masks of the long-nosed rain god Chaac. One has to look very closely to see it is Chaac – it looks more like a geometrical motif. 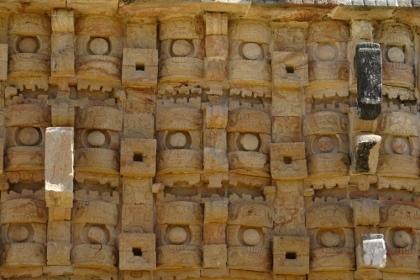 This massive repetition of a single set of elements is said to be unique in Mayan architecture. It’s weird for sure, but I did not find it esthetically pleasing. 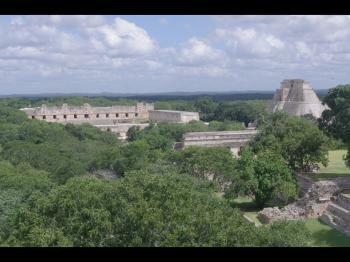 The site of Uxmal is much bigger, but not as huge as Chichen Itza for example. Rain and the Rain God Chaac are a common theme here too: this part of Yucatan is very dry, and there are no cenotes. The locals had to rely an rainwater, and built cisterns to save it. And they prayed to Chaac a lot I guess. Right after the entrance you stumble upon the perfectly shaped Pyramid of the Magician. This is the gate to the Nunnery Quadrangle, an enclosed area with a central plaza and buildings covering all four sides. To me this is the best part of the site. It has long, palace-like buildings, richly decorated with stone mosaics and more depictions of rain gods. It did remind me in a way of the modern structures at the UNAM. Explanations by way of information panels are much better here than at most archaeological sites in Mexico. I spent about 1.5 hour at Uxmal, looking for example at the ball court and a pretty vaulted arch that is its entrance gate. There are a lot of other bulky structures at the site, but just as in Kabah they didn't really work for me. Uxmal became one of my favorite WHS. The number of monuments, their quality and the level of details featuring the Puuc architecture make it great treasure. Although se in the middle of the forest, the site is very easy to access, so are the sites of Kabah, Labna and Sayil, which complement the site. This WHS provides one of the most striking testimony of the Maya civilization. I visited this WHS end December 2015 - beginning January 2016. Contrary to what the name suggests, this WHS is made up of a series of archaeological sites on the Puuc Route and not only of Uxmal. Uxmal is definitely the crown jewel of this WHS. It is the largest and most visited site in this series and it is the one which can easily be appreciated as a fully-fledged Mayan city. 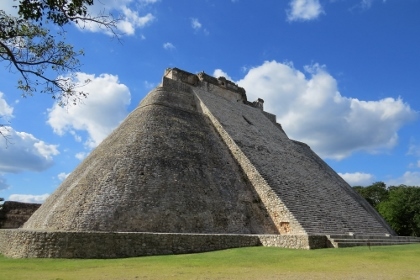 The 3 highlights of Uxmal are the Pyramid of the Magician, the Governor's Palace and the Nunnery Quadrangle. The Nunnery Quadrangle is beautifully carved and in a very good condition. I enjoyed the rather touristy sound and light show mainly for highlighting the huge serpent carved on the nunnery's wall. The masks of the rain god, Chaac, reign supreme and are present everywhere. However, these are even more evident and repetitive in the other minor sites in the series. I started by visiting Labna which is the farthest away from Uxmal and close to the Loltun Caverns. The site is very small when compared to Uxmal however its main sacbe and the famous arch (picture) with geometric motifs are definite highlights of what was once an elaborate road network from one city to the next. Close to Labna, I visited Xlapak which is the least impressive of the series and receives almost no mention by Unesco. In all sites, attention to detail is given while restoring these sites and every single stone is numbered to try to fit the pieces back in an enormous and difficult jig-saw puzzle. Xlapak's main highlight is the palace-like structure which is more comparable to the style in Becan and Chicanna. Next I visited, Sayil which is bigger than Labna and has a lot of Chaac carvings. I really enjoyed visiting these sites and being the only visitor for hours on end which was quite a welcome surprise when compared to the more famous Uxmal. Both Labna and Sayil are a bit over-the-top with the repetitive Chaac carvings but the site of Kabah is a total exageration. The Mayans really must have wished for lots of rain to build such a structure. Being closer to Uxmal, I wasn't alone. 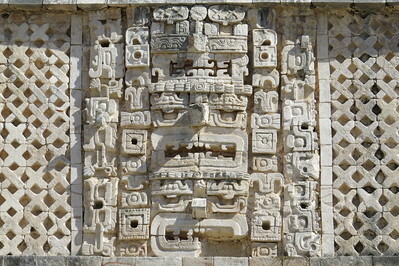 I would recommend visiting this site in the afternoon to fully appreciate the Chaac masks' detail in the afternoon sun. All in all, I really enjoyed my visits here and would surely recommend visiting at least a couple of minor sites together with Uxmal. Uxmal is near Merida on the Yucatan peninsula. Uxmal is less frequently visited than nearby Chichen Itza. This ruin is indicative of the Puuc style of architecture and was built around 300-950 AD. The pyramid of the magician is crisply restored as are many other buildings but others are still in complete ruin. The Palace of the Governors is built on the highest point in the area and has some unusual carving. Look for the grotesque carved masks and chak carvings. Also, don't miss the separate site of Kabah nearby. The arch has some original hand prints on it. Some comfortable hacienda style hotels are nearby. I don't think you can get here on a public bus but you can book a tour from Merida and maybe even from Cancun. The place was deserted when I visited in 2003. Built in the 8th century: Although settlement dates back to the Pre-classic Maya period (c800BC) the main development "was in the Late Classic Period (AD 650-1000).. Radiocarbon dating suggest(s)that the main structures in the complex were built between AD 700 and 1000" (AB). Uxmal was abandoned C1200AD.